UPDATE, 1:15 p.m.: It’ll be a little while before the Elections Office gets its post-election report up on their website, so here it is in the meanwhile. With a 46-vote margin, Bergel seems safe from any potential recount. In other news: Eureka’s Measure S school bond measure cruises to easy victory; Measure Y, in Jacoby Creek, barely fails. DOWNLOAD FULL POST-ELECTION REPORT HERE. 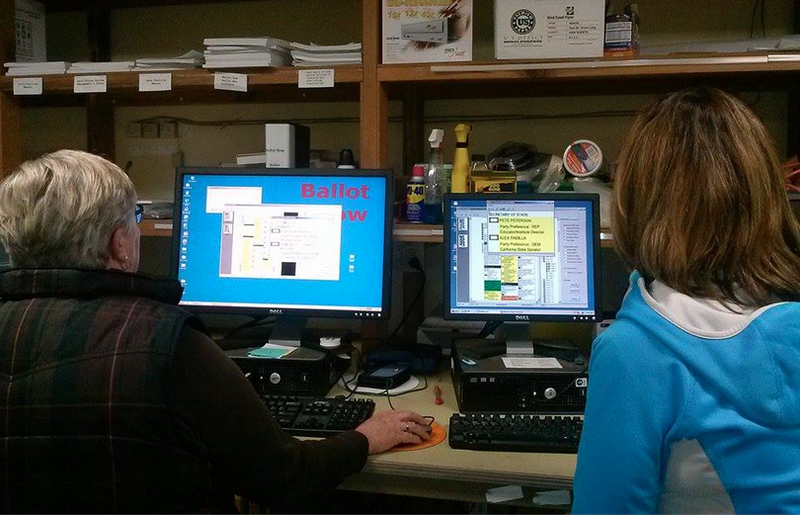 Above: Carolyn Crnich and Kelly Sanders of the Humboldt County Elections Office reconcile the final votes. Original Post: The new math is in. Kim Bergel now leads Mike Newman by 46 votes. Oof. LoCO is down at the Humboldt County Elections Office where the uncertified final election results have just been released. Obviously the nail biter of most interest was the tight race between Eureka City Council Ward 3 incumbent Newman and challenger Bergel. After election night earlier this month, Newman led Bergel by a measly 104 votes. Well, the latest tally puts Bergel at 3359 votes to Newman’s 3313. We’ll update this post in a few, but again, we must note that these results aren’t official official, but, yeah, that about does ‘er.